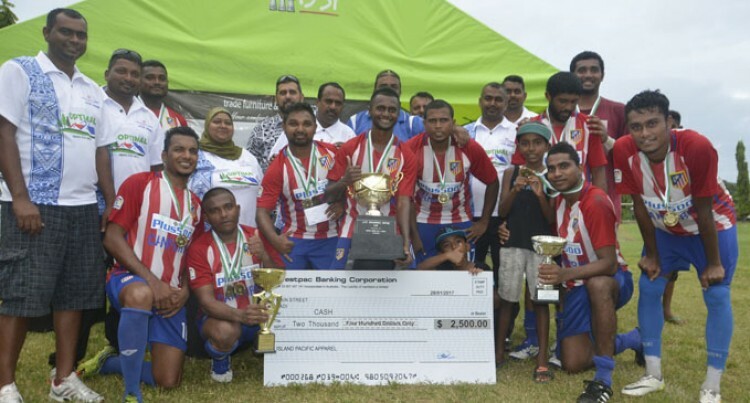 National Futsal rep Altab Sahib scored a hat-trick as Northpole Friends became the first southern team to win the Island Pacific Apparel sponsored Futsal Carnival at the Nadi Muslim College grounds yesterday. The Nasinu based-side beat Marriott of Denarau 3-1 in the final with the New Zealand-based striker in stunning form. District rep Josefata Dugucagi equalised five minutes later as they locked 1-1 at halftime. He also missed two crucial penalties. After the pep talk Sahib scored two more goals to contribute to his tally that earned him the Golden Boot award for scoring 12 goals in the two-day tourney. Northpole had the services of seasoned reps Nathan Kumar, Ravinesh Karan Singh, Mira Shahib, Arvin Pratap and Dinesh Mudaliar. Team captain Vineet Naidu said they had been taking part in the tournament in the last three years. “We have been competing since 2014 and we are the first southern team to win,” he said. The team won $1500 and Marriott pocketed $600. Marriott skipper Edwin Reddy was gracious in defeat. In the first semi-final Marriott beat Bounty 2-1 while Northpole beat Southern Forest 1-0. Quarterfinal results: Namaka 0 – 2 Northpole 2, Southern Forest 1-0 Red Devils, Marriot 2 –1 Samba Kings, Youngstars 0 – 2 Bounty II.